Steve Schaefer describes the "Overlap" as the time between Jesus' first arrival here on earth and His second coming. He explains how the Kingdom of God consists of 'already' and 'not yet'. Does that sound complicated? No worries... the author does a great job of explaining just what that means in our daily lives. The first two chapters, which is part one of the book, cover the Old Testament Predictions and their New Testament Fulfillment's. A lot of good information laid out plain and simple. Easy to understand. 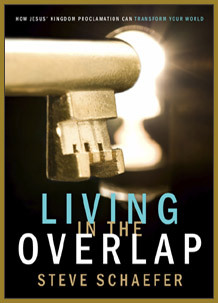 He includes in the book a fold-out diagram called The Kingdom Dartboard, which by the way, is available for download on his website, http://www.livingintheoverlap.com/. Part two of the book deals with daily living. Issues such as Loving Others, Praying for Healing, Walking by Faith, Working Together as a Body, and Being Used by God are addressed in these next chapters. He uses examples from his own life that makes it more personal. It's an easy book to read. Not overly technical... if that's the word I'm looking for. Some books that deal with a particular subject seem to go way over my head. But not this one. Don't get me wrong... there are more than enough scriptures and references to back it up, over 40 pages of End Notes and Recommended Reading in the back of the book. I just appreciate how he writes as if he's talking to me and not standing in front of a classroom. I've seen a few new books that deal with living a 'real' christian life. Not just labeling yourself a christian, but living like you believe what God says. If living what you believe is of interest to you... then you will want to read this book. I know I will be referring back to it again and again. It's given me something to think about.